Aardman Animation’s unspoken kinship with the Monty Python legacy takes another step forward with their debut adaptation of Gideon Defoe’s The Pirates! book series, subtitled Band of Misfits. It’s an appropriate title since in the modern animation world of CG, 3-D and IMAX, Aardman’s comparatively quaint stop-motion technique—making its return to the big-screen after 2005’s Wallace & Gromit: The Curse of the Were-Rabbit—feels like a stubborn outlier in a high-tech world (even though Band of Misfits also gets full the 3-D treatment). Set in 1837, a middling marauder with a luxuriant beard and the rather mundane moniker of the Pirate Captain (Hugh Grant), harboring dreams of winning the coveted Pirates of the Year Award, sets sail to out-plunder his rivals. During one in a number of booty-less raids, he boards the Beagle and encounters a young Charles Darwin (David Tennant), drawn here as a sniveling, duplicitous glamor-seeker. Assisted by his chimp-servant Mr. Bobo, Darwin recognizes that the Pirate Captain’s purportedly rotund parrot Polly is really the last living dodo bird. Darwin convinces the Captain and his crew to sail for London to enter Polly into the Royal Society’s scientific discovery contest with the promise of a priceless prize for the winner. There’s enough animated action here to keep kids interested, but just barely. Mostly, the chuckles skew more mature, including knowing references to Jane Austen, lepers and the Elephant Man (my hardiest guilty laugh). Queen Victoria (Imelda Staunton) is a bleating shrew with a distaste of buccaneers but an appetite for exotic cuisine. 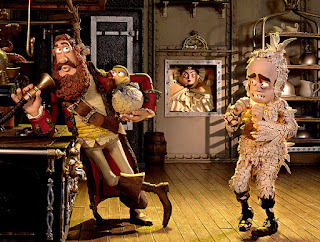 Directed by Aardman co-founder Peter Lord (helming his first feature since Chicken Run), the set-up for Band of Misfits is like a send-up of the Pirates of the Caribbean franchise peppered with references to 19th century British pop culture. The result is amply witty, but it’s also a bit detached as times, lacking in narrative or comedic drive. The humor is so decidedly English that many quips will undoubtedly capsize on their way across the Atlantic—indeed, in the U.K. the film was released under the name The Pirates! In an Adventure with Scientists. Still, backed by vibrant voice talent and CG enhancements to their distinctive visuals, Aardman has created another cheeky charmer. You’ll come for the pirates…you’ll stay for the sidelong discourse on natural selection.